The Cooking Photographer: Buttermilk Biscuits, with a buttermilk substitution list. Buttermilk Biscuits, with a buttermilk substitution list. 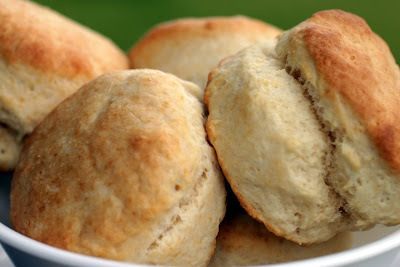 Frequently used, this old-fashioned biscuit recipe holds a coveted spot in my kitchen drawer. These tender biscuits are a blank canvas for sweet or savory adaptations. Try adding garlic powder, onion powder, chives and parsley, or add something sweet like streusel topping kneaded in to make ribbons of cinnamon sugar. Of course you can always eat them plain with honey or jam as my family prefers. Pre-heat oven to 450 degrees. Cover a baking sheet with parchment paper. Put flour, baking powder, baking soda and salt into a food processor and process to mix. Add butter and pulse until crumbly with small pea sized butter pieces still in places. Add buttermilk and pulse just until the dough comes together. Flour a surface, dump out dough, and then flour top of dough. Kneed a few times and roll out to about 1 inch thick. Cut out biscuits with a drinking glass or biscuit cutter. Continue to roll out dough and cut biscuits until dough is used up. Because I don’t always have buttermilk lying around, here are some buttermilk substitutes. Use one. 1. 3/4 cup plain yogurt or sour cream. 2. 2 teaspoons lemon juice or vinegar, plus enough milk to make 2/3 cup (3/4 is too much here). Set aside for 5 minutes before using. 3. 3/4 cup milk plus 1 1/4th tablespoons cream of tartar. 4. 3 tablespoons buttermilk powder and 3/4th cups water. I never have buttermilk either, and I usually use the vinegar/milk substitution. Thanks for the tips on other ones too! My favorite thing to put on them is apple butter. Apple butter is a fantastic idea! About how many does the recipe yeild? It depends on the size. With extra large biscuits it's about 6 or 7. About double that for the next size down in the nested biscuit cutters if I'm remembering right. Yay! I am happy to hear that. Thanks Lucy. Does this recipe freeze well prior to baking? p.s. I like the photos on this blog! Thanks! And I don't know if the dough freezes well. I've never tried before. I bet it would at least in the short term. I made these biscuits for breakfast today - made the dough (by hand - no food processor in our small apartment! ), shaped the biscuits roughly by hand, and then put the whole tray in the freezer overnight. My roommate popped them in the oven when she woke up in the morning and we each ate two with honey. So yummy and fluffy!! Thanks for the great recipe - I love biscuits *especially for breakfast* and these were easy and delicious! Very cool! I'm so glad you guys liked this one!